“We looked forward to the seminar for many months, from the time Ray bought the reservation. And we got more and more excited about it the closer the time came to attend. But the morning we drove to the Green Valley Ranch where the event was to take place, I felt as jittery as I used to when attending grade and junior high school. I had butterflies in my stomach. It was the usual fear of the unknown that I experienced when getting ready for school every morning and couldn’t eat breakfast because of a nervous stomach. “But as soon as we got to the event center in the hotel, all jitters left. We were welcomed by the very friendly girls behind the desk where we received our name tags and bag of goodies, the books and information regarding what we would be hearing and learning about during the seminar. “We entered the conference room and were pleasantly surprised that there was a reserved section for VIP members and that we’d be sitting at tables. The little boxes filled with notepads, pens, and candies were a nice touch. “Every day, we looked forward to the coffee breaks because each time we were served something different! “We found the format for the seminar especially interesting because we could compare places to live as the presenters talked. We felt the different speakers were interesting and presented their places of residence very well. “Before the three-and-a-half days of your conference were over, we had broadened our thinking and included Medellín, Colombia, and San Miguel de Allende, Mexico, too. Now, we have to decide among three places, and we intend to go for a month to each of these places before settling on one. “I was very surprised when Kathleen told us from the podium that a man had been convinced through the conference not to retire overseas. This was the exact opposite for us. If anything, it whet our appetites even more and got us even more excited for the move. 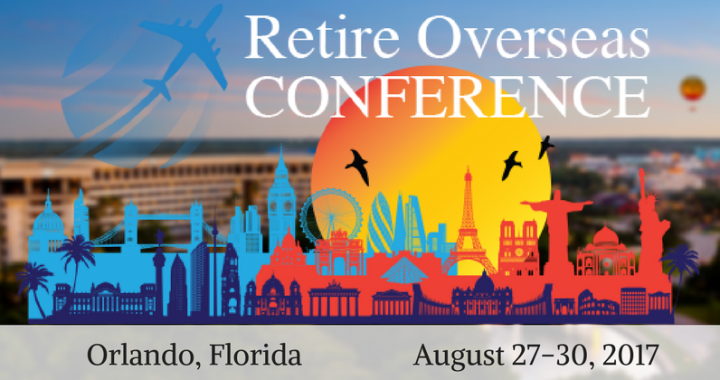 Joining us for the Retire Overseas Conference is often the first big stepping stone our readers take on their going-overseas journey. It’s where everything starts to finally feel real… and achievable. And from which—apart from the guy Margaret mentioned above—there’s no going back. In a good way. If you’d like to set the wheels in motion for your own adventure overseas—and figure out where that will be and how you can make it happen (with our experts on your side to help)—then this event is for you. I hope to see you this fall for our biggest (and most fun) event of the year. Posted in Live And Invest Overseas Confidential and tagged 2017, lios confidential, orlando, retire overseas conference, ROC.